Acting Balanced: Ending tonight and tomorrow!!! 2 Tween/Teen Books - The Truth and Secrets ends 12/02 - if you have girls 8-14 on your holiday list, I highly recommend entering to win these books! This package contains: The Truth: I'm a Girl, I'm Smart and I Know Everything and Secrets: You Tell Me Yours and I'll Tell You Mine Maybe ! Ending Tomorrow: Kids Companions Chewelry This product is great for fidgeters and chewers!!! Low entries and two winners!!! 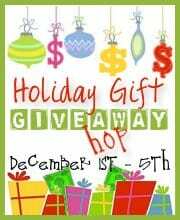 And don't forget about The Holiday Gift Giveaway Hop!